1. Central Development of Preparatory Work. - The tests in question were consequent upon the acceptance of a proposal for the construction of a captive helicopter, offered by 1st ДальшеMore>>> Lieut. Stefan von Petroczy, then Commander of Balloon Pilot Instruction, to the Imperial and Royal War Office. Lieut. von Petroczy also requested to be accredited with a certain sum for testing expenses. The first tests were made at the Austrian Aeroplane Factory, Ltd., Wiener-Neustadt. with propellers of rather large diameter. The Daimler works at Wiener-Neustadt also received an order from the Aviation Arsenal to hurry on the construction of a light 300 h.p. electro-motor originally intended for giant aeroplanes. As this motor was intended to weigh 250 kg. only, according to the statement of the firm, the possibility of constructing an electro-motor with power provided by means of a cable was taken into consideration. The Austrian Aeroplane Factory proceeded no further than general drafts. When the present writer was entrusted with the direction of all the tests of the captive helicopter, in the early part of 1917, the work was commenced systematically along two lines. First of all, tests were made at the propeller-testing laboratory at Fischamend; secondly, model tests were carried out in order to throw light on their stability conditions, beginning with very small models worked by rubber cords, then with a heavier 30 kg. model driven by a 5 h p. air pressure motor specially constructed for the purpose. These tests led to the discovery of a special kind of cable which ensures stability, and which was used in all later models. On the basis of the above-mentioned preliminaries, tests were proceeded with along two lines: one by means of electric power, and the other with petrol rotary motor power. We shall now give a short description of these two methods, with a report of the tests carried out. 2. Short Description of the Captive Helicopter having Electric Power. - The machine was completely equipped with electro-motor, electric cable and winch before being tested working on the ground. The framework itself is composed of steel tubes, with an observer's car in the centre, from which there is a clear view and firing range in all directions. The lifting power is furnished by four propellers driven by a motor by means of cone gear. Its weight empty, including motor and propeller, is about 650 kg. The electro-motor weighs 195 kg. ; according to the Daimler Co., its output should be 225 h.p. (originally 300 h.p. with 250 kg. load), and it has actually yielded 190 h.p., though in that case the motor was heated to such an extent, after 15 minutes' working, that the test could not be carried on. Even with this reduced power, the lifting tests resulted in a carrying capacity sufficient for three men. In consequence of difficulty with the electro-motor, the captive helicopter has not yet been flown with electric power. The electro-motor was built into the machine, which then rose from the ground and attained a low altitude with three passengers. After a run of about 15 minutes, however, the motor caught fire, and had to be returned to the Daimler Aviation Section unaccepted, where it is now undergoing repairs. The advisability of equipping the already completed machine with two rotary motors, which necessitate the instalment of transmission gear, was considered, but the idea was not carried out for want of suitable motors. The machine belongs to the Austro-Hungarian Military Administration. 3. Short Description of the Captive Helicopter having Petrol Motor Power. - The captive helicopter with petrol motor power consists of a three-armed frame made of steel tubes, in which the motors M1, M2 and M3 are built. The motors (Le Rhone motors, 3h. producing 120 h.p. reconstructed for the tests) drive two propeller-shafts, revolving in opposite directions, by means of the transmission gear, and these propeller-shafts in turn drive two wooden propellers, each 6 m. in diameter, at about 600 r.p.m. Three petrol tanks are installed near the motors. The entire system, is supported by a large pneumatic buffer, which is kept tightly filled with air through an air-pump driven by the motor; under the end of each arm three small buffers are similarly disposed. The actual object of these buffers is to reduce the shock in abrupt landings. The observer's seat, made of three-ply wood, is situated over the propeller and strongly secured to the stationary gear-case by the concave interior propeller-shaft. A machine-gun turret is located on the upper rim of the observer's seat. 1. Automatically, in such wise that when a regulator, adjusted for the purpose, falls below a certain number of revolutions of the propeller, it releases a mechanism which ejects the parachute. This ejection from the centre causes the parachute to open instantly, and tests have proved that it begins to work after a drop of about 25 m. This device thus insures the captive helicopter against damage, in case the motor should stop at low altitudes. The same mechanism brings the motor to a standstill at the time of ejecting the parachute. 2. The parachute may be worked by hand, by the observer, who is also provided with a bag parachute for personal safety. 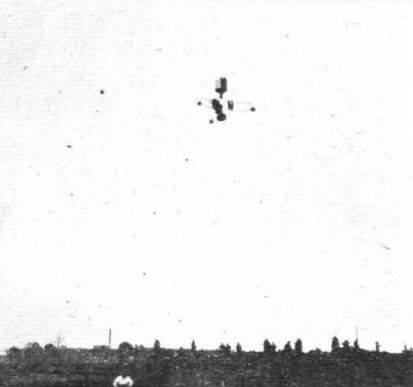 We may here observe that there is need for the use of the parachute only when at least two motors have stopped, two motors being capable of maintaining the propellers at a sufficiently high rate of revolution. The climb takes place as follows: When the observer has taken up his position, the motors are started, and this creates no difficulty by reason of the fact that one motor at work causes the others to revolve. The functioning of the motors can be controlled by the observer, and future types of the captive helicopter will have the necessary instruments located within reach of the observer. As soon as the motors have attained the full number of revolutions, a signal will be given for the loosening of the winch, and the machine will then, according to present experience, climb at a speed of about 1.2 m. per sec. This climbing speed mainly depends upon the pitch of the propeller and the direction of the wind, and it can therefore be considerably increased. The captive helicopter is brought down by reversing the winch. Up to date, the motors have always been run at full power, in which case the excess of lift must be compensated. In future, the motors will be throttled in order to diminish the work of the winch. The total weight of the captive helicopter, with engine and fuel for one hour, but not including the observer and the machine-gun, is about 1,300 kg. It is strongly constructed, and some slight lessening of weight may yet be attained. At starting, about 1,800 kg. were measured, that is, about 5 kg. per h.p. This figure can be considerably augmented by enlarging the propellers. The original type of captive helicopter with petrol motor power was manufactured by the firm of Dr. Liptak, Ltd., Budapest-Szentlorincz, under the special supervision of my collaborator, Lieut. Eng. W. Zurovec, and the above-named firm owns our patent. It may here be mentioned that 1st Lieut. von Petroczy was most energetic in promoting the work above described. 4. Test Flights with Petrol Machine. - The reports of the test-flights undertaken may be summed up as follows :- From April 3 to 5, lift and stability tests at low heights, duration tests up to 60 minutes. From May 17 to June 10, climbing to 10 m.-50 m. altitude. Results: Lift excess on the ground to a load of 4 men. Perfectly tranquil soaring at an altitude of 50 m. Wind velocity during tests up to 8 m.p.sec. After about 15 successful flight tests, the machine had a breakdown when landing on June 10. The power of the enemy motors, which had been recently repaired, diminished so considerably that there was an insufficient excess of thrust, and the machine therefore oscillated violently, especially while being brought down. The crew abandoned it, and the machine turned over on the ground, the propeller-blades sticking into the earth. Considering the state of the motors, my collaborator, Lieut. Zurovec and I wished to omit the tests (there being a wind velocity of 8 m.p.sec. ), but were urged to carry them on by the Commission surveying the tests. The results fully confirmed those already arrived at with model tests, so far as stability is concerned. Observations made in the wind proved that, in addition to the fundamental demand for ample excess of thrust, the position of the centre of gravity of the machine in its relation to the plane of rotation of the propeller is of great importance. The results obtained in that respect, both in theory and by means of practical tests, should be of the utmost value as applied to the construction of a second type. (a) Captive Helicopter with Crew, for Observation Purposes During War on Land. - The advantages of the captive helicopter as compared to captive balloons are as follows :- They are but slightly visible, and therefore provide limited target area for artillery; they are mounted with guns and axe specially adapted for shooting upward during attacks by aeroplanes; they are non-inflammable, they can be started without any loss of time and can be rapidly transferred from one place to another. The comparison may be continued by stating that :- A balloon-section on the south-west front, with one balloon, requires :- 1 automobile winch-wagon, 2 automobile gas-wagons, 3 freight wagons, 6 officers and 137 men, whereas a captive helicopter requires :-1 automobile with three trailers, 1 freight automobile, 6 officers and 20 men. (b) Captive Helicopters for Observation from Battleships. - Adapted in a suitable manner, the captive helicopter might prove to be the best possible means of taking long-distance observations from battleships. (c) Captive Helicopters for the Protection of Open Towns and Coasts from Aeroplane Raids. - A series of captive helicopters would not only be able to give warning of the approach of enemy aircraft, from a long distance, but might also be able to open effective defensive firing, if properly armed. (d) Captive Helicopters without Crew for Radio Purposes. 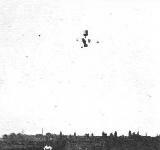 - Tests hitherto carried out with kite-balloons or antenna have always been unsuccessful either on account of a breakdown of the kite-apparatus at a low wind velocity, or because of disturbing motion of the balloon antenna during squalls. These difficulties would be avoided by the use of captive helicopters, and are therefore of particular utility for colonies and districts where stable mast-construction cannot easily be carried out, and which may also give rise to great outlay. (e) Captive Helicopters for Meteorological Work. - By means of the captive helicopter, registering devices can easily be taken up and measurements carried out rapidly in all weathers. 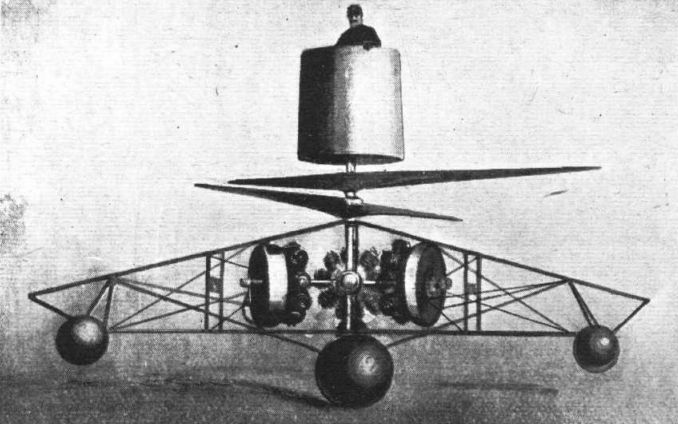 The Petroczy-Karman Captive Helicopter: The spheres under the framework are pneumatic shock-absorbers. Each of the Le Rhone engines has its petrol tank mounted concentrically with it, so that the petrol system should be of the simplest. The Petroczy-Karman captive helicopter in the air. 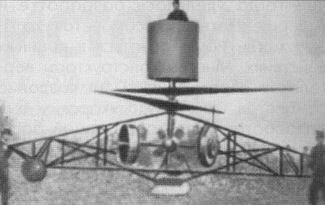 THE PETROCZY-KARMAN HELICOPTER: Side elevation and perspective view of the machine as it appears from below.